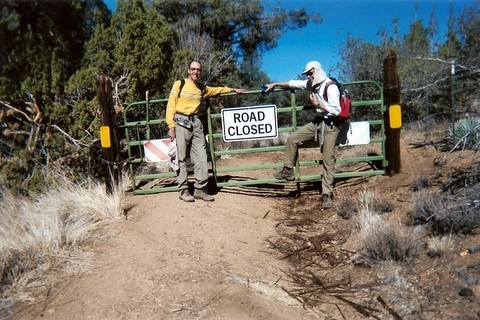 Over 600 feet of aerial tramway, thousands of feet of tunnels, drifts and shafts- mostly unexplored and uncertain ownership. 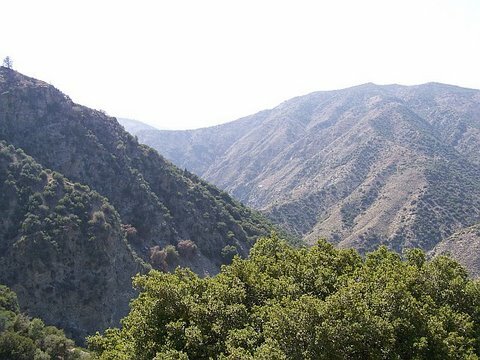 It is located about 15 miles southwest of Gorman several miles inside the Ventura County line. 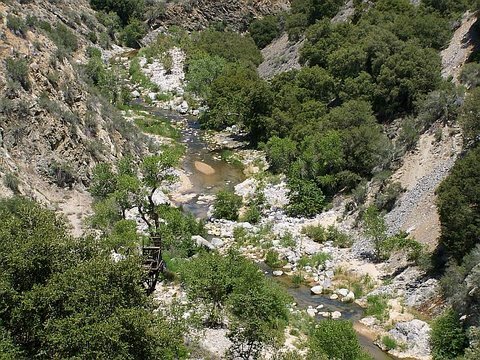 A four mile hike brings you to Piru Creek. 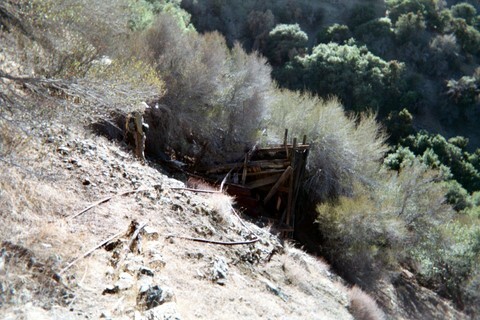 There an aerial tramway with iron cables extends 600 feet up the hillside with the lower end of the cables at the creek. There is also a lower tram building and a donkey engine used to move the cables. 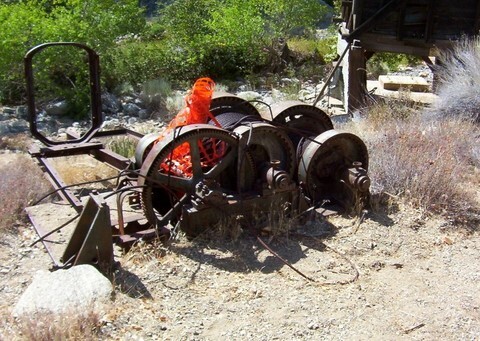 It all began in 1841 when placer mining started in Piru Creek- reportedly the first time gold was discovered in California. 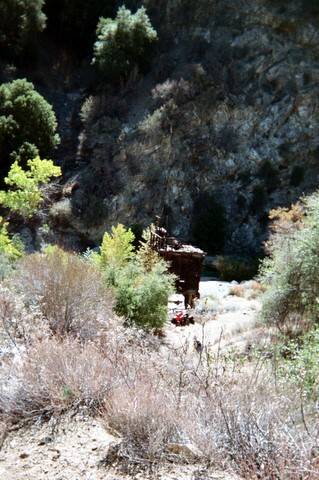 Hard rock mining began in the late 1860's or 1870's on the hillside above Piru Creek. 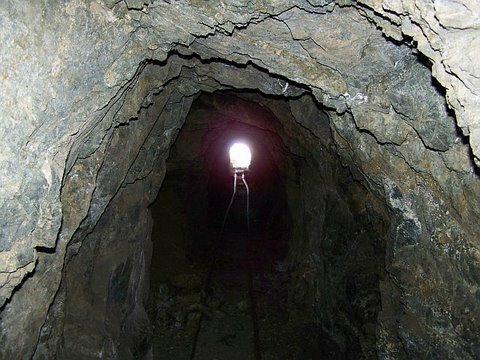 By 1888 hundreds of feet of tunnels and drifts had been dug and a cable tramway installed extending 600 feet up the hill to the main tunnel (middle tunnel) to transport the ore to Piru Creek where a 5-stamp mill was erected. 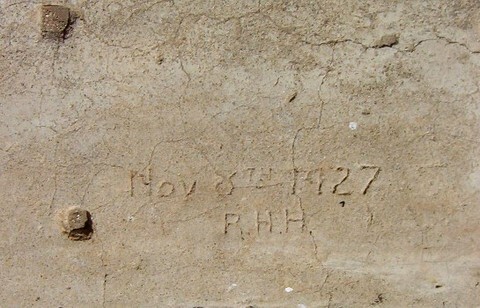 The owner during this period was an Alexander Fraser. 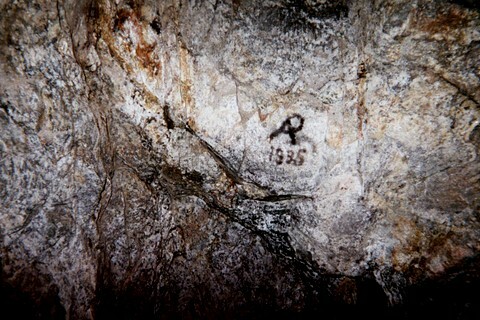 In 1908 the government issued a patent awarding ownership of the mine area to him. 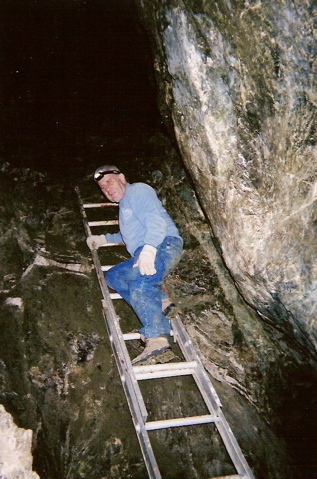 However by 1925 the mine was idle and has largely remained so ever since. But an increase in gold prices made the Castaic Mine moderately profitable for several years in the mid 1930's depression era. 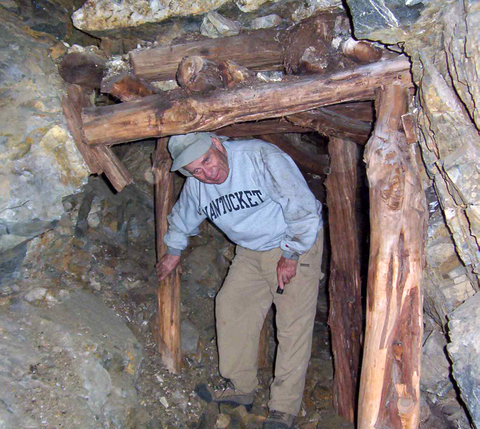 By 1935 the mine was being worked and perhaps owned by former Castac Mining Company superintendent Paul Meacham assisted by James Young, an unemployed engineer. 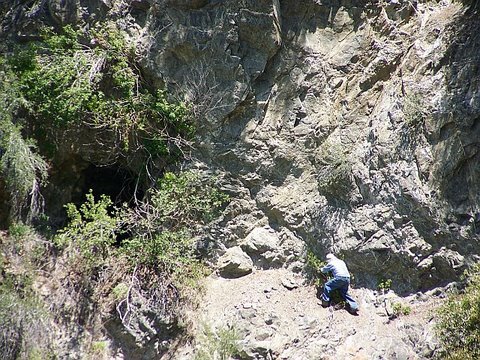 In their efforts to find higher grade ore they continued mining activity including expanding the middle tunnel recovering about 20 ounces of gold a month while living at the mine site. 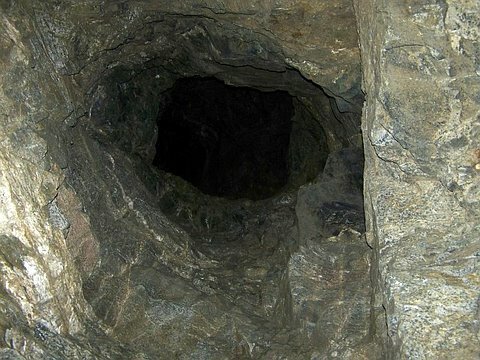 However their attempts to sell the mine were unsuccessful and both men had left by the late 1930's. Ownership during this period is somewhat unclear. 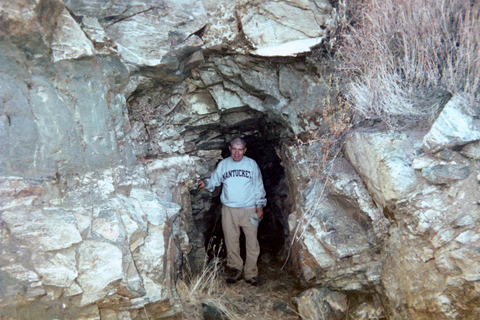 Meacham was most likely a co-owner of the Castac Mining Company. In any event in 1940 Klaus Kemp, a well-to-do Santa Barbara businessman and city councilman, purchased the private inholding from the Castac Mining Company. It is not clear whether this purchase included the mine itself. 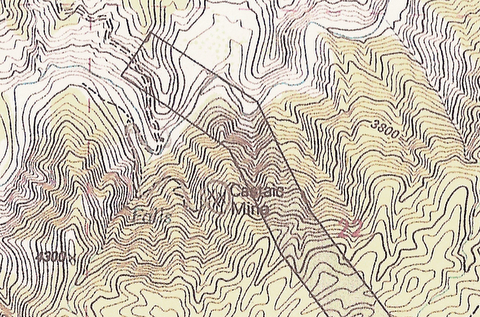 The private inholding purchased is shown on the Alamo Mountain Topo which shows the mine slightly to the west of the inholding. 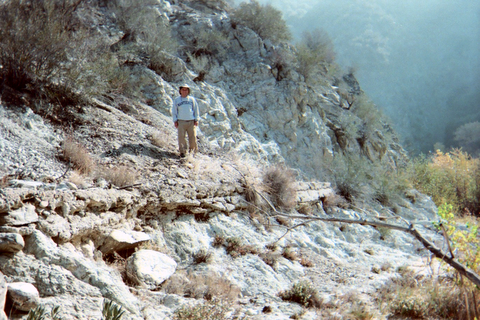 In the early 1940's Mr. Kemp constructed a four mile road leading to the mine so as to process the mining tailings. Prior to the road equipment was brought in by mules. Currently the co-owners of the private inholding are Mr. Kemp's son, Karl Kemp and a female relative. In 1975 Klaus Kemp donated the 5-stamp mill to the Santa Barbara Historical Museum where it remained until 2006 when it was transfered to the Fillmore Historical Museum. It is now (December 2007) in the small neighboring community of Piru, dissassembled and stored on pallets. 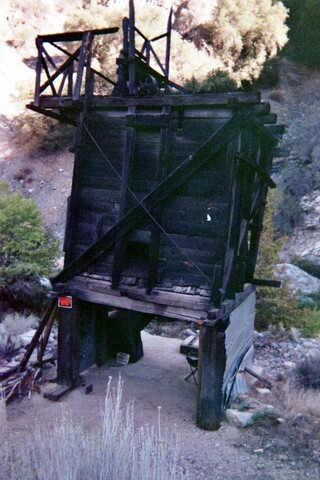 Efforts are presently being made to have the stamp mill displayed at the Mt. Pinos Ranger Station in Frazier Park, not far from it's original location. 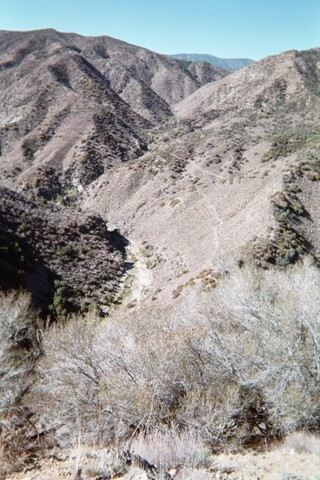 The writer accompanied by Frank Toothaker, Daniel Veelik and Eric and Mike Bull journeyed to Piru Creek in October 2007. At the creek we went up a trail leading to the top of the cables. At the top of the cables was an upper tram station and a large mine opening. We walked through the tunnel and estimated its length at about 1,000 feet with two side passages adding another 500 feet for a total estimated length of 1,500 feet. In two places we could see an upper level about 50 feet above. 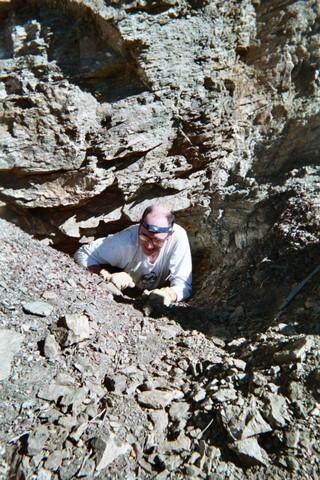 After leaving the mine we continued up the trail another 60 feet and one of our group (Frank) crawled about 80 feet into a small passageway. 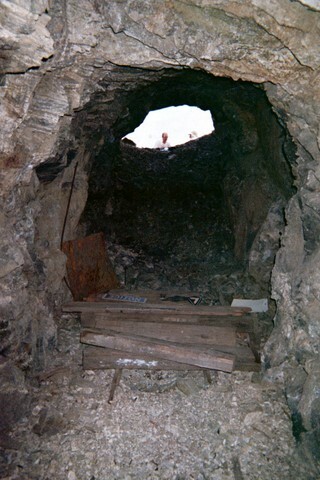 It ended with collapsed passages which might lead to the upper level observed in the main tunnel below. 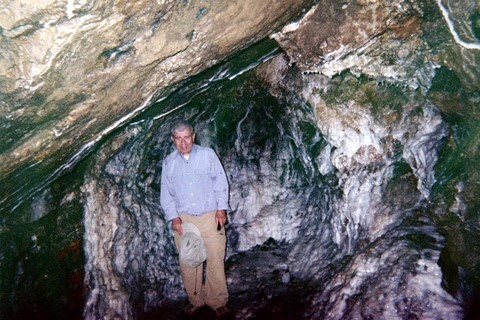 While returning down the trail we noticed a large mine opening several hundred feet to our right. 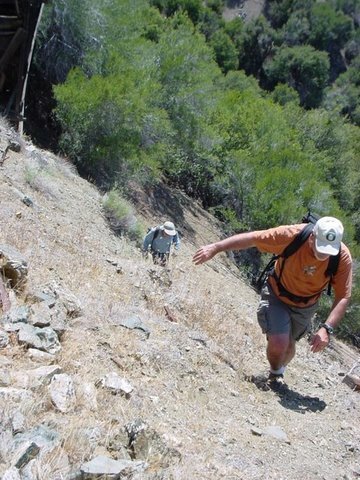 Eric and Mike worked their way as close as they could to the opening by following a narrow, crumbly, downward slanting ledge leading to the tunnel opening. They turned back on the ledge about 70 feet from the opening because of increasing exposure. It appears there are three main tunnels. 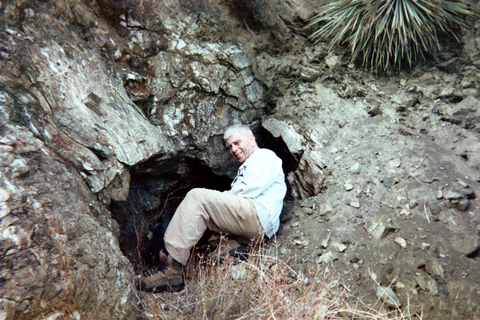 In November 2007 Frank Toothaker and the writer again visited the Castaic area. 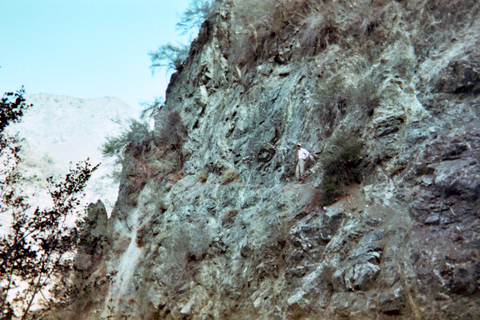 Frank went on the infamous ledge to about 40 feet from the mine before turning back. 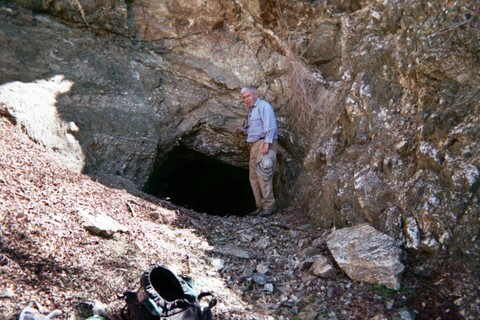 Frank and the writer then examined the mines shown on the topo a mile away from Piru Creek. 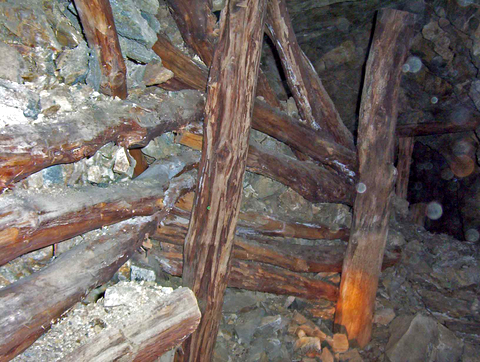 One mine was collapsed at the entrance but a second went in for over 100 feet but had large numbers of support beams indicating unstable rock. In May 2008 the writer accompanied by Frank Toothaker, Stuart Rosenberg and Derek Swezey made another trip to the Castic. They first mapped the Middle Tunnel at 1,200 feet with three side passages (all on the right) mapped at 44 feet, 365 feet and 52 feet totaling 461 feet for a grand total of 1,641 feet for the entire tunnel. They then ascended the upper level via the 30 foot shaft on the left side. They found it rather confusing with several passages going in various directions. An extremely rough estimate is something like 500 feet of passage on that level. Much more exploration and mapping needs to be done in that area. Finally on the hike out the writer attempted to reach the Lower Entrance via the "Slanting Ledge" trail. I was successful but in the excitement of attempting to reach the Lower Entrance forgot to bring my summit pack with my lights. With no lights I was only able to go in about 30 feet past the entrance which is over 6 feet high and 4 feet wide. The passage continues past this point. 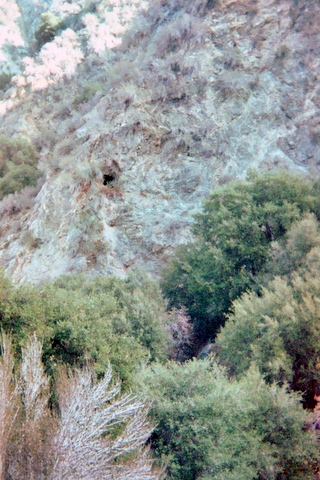 The Castic Mine is shown on the Alamo Mountain topo as being within the Los Padres National Forest about 600 feet west of a privately owned enclave. Despite this the owner of the enclave has informed the writer that he is claiming ownership of the mine. 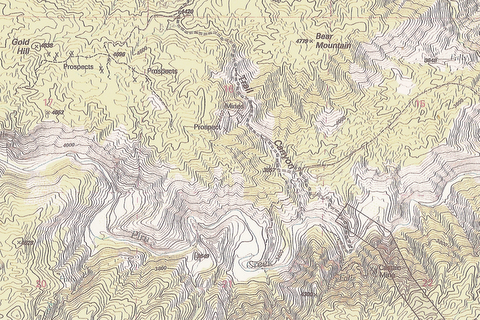 Forest Service officials appear uncertain but have stated that the topo may be incorrect. 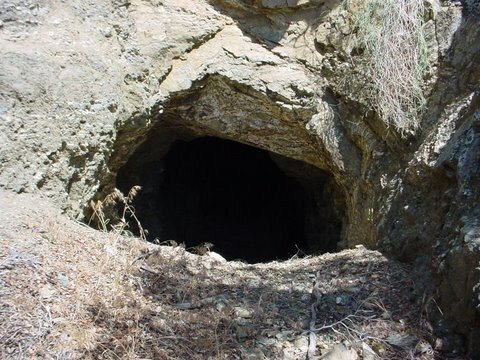 Our appreciation to former local residents Tim Galbraith who first brought the mine to our attention and archaeologist Jason Marmor who provided us with much of the history of the Castaic Mine and is extremely knowledgeable concerning the mining history of Ventura County. Also thanks to Frank Toothaker, Stuart Rosenberg and Derek Swezey as without their assistance our trip would not have been so successful.